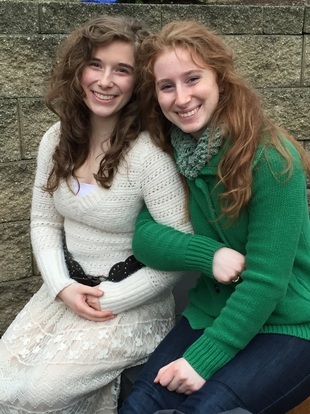 Emily and MaryKathleen are sisters in family and music. From an early age, their bond with each other and their love of music brought life to all around them. Years of consistent training and performing have refined their skills and passion for making music together. With Emily on the flute, and MaryKathleen on the harp, the two combined bring all listeners to experience the beauty and serenity of "Emerald Wind Music". ​Emily is the eldest of the Scordato family children (7) musicians. 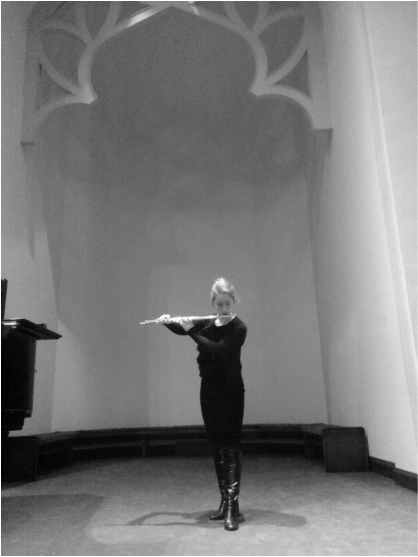 She began her love and study of the flute at the age of three. She studied under the tutelage of a pastor's wife, Janine Solberg, in Rockford. Mrs. Solberg always made comment of Emily's perfect ear. She would quite often have her other flautists tune to Emily's flute. When her teacher joined The Rockford Music Academy Emily followed her until her retirement and now Emily studies under Jacques Saint-Cyr. She has played with the Rockford Symphony Youth Orchestra and is studying at University of Wisconsin pursuing a degree in music and instrumental performance. Emily has multiple music compositions for flute solo and for duets as well. MaryKathleen is the second eldest Scordato sibling. She started music training at the age of three but on the piano. Then after a couple years of violin finally decided on the harp at the age of 9. She began her studies at 9yrs old with Gina McClancy. Mrs. McClancy retired from the Rockford area, and MaryKathleen then joined The Rockford Music Academy. 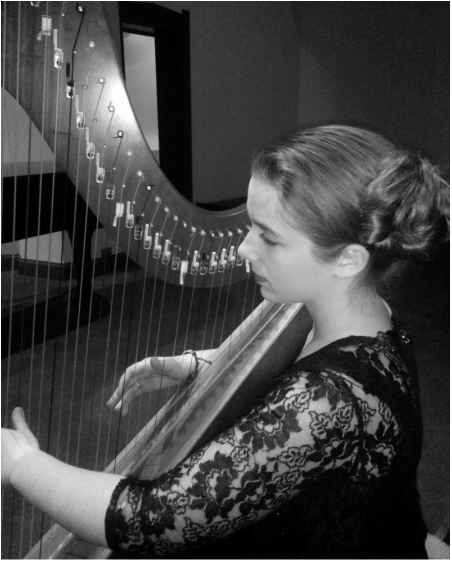 She now studies under Melissa Haeze, who was a student of Rockford Symphony's harpist Nanette Felix. Her life ambition is to be a nurse practitioner and to use her music for therapy to aid in the process of healing. MaryKathleen has written a Russian Ballad named "Dance of Dreams" amongst many Celtic musicscapes with her sister Emily. Joseph, started music later in life at the ripe old age of 12. He studies guitar under Ted Stavrou at The Rockford Music Academy. He aspires to learn a variety of instruments in the small stringed instrument family such as the mandolin. Joseph also picked up the bodhran (pron. bow-run) an ancient framedrum known for being the heart of the Irish music and has begun performing with his sisters around the Rockford and Beloit area. Christopher began playing the flute at 3, with his sister Emily's help. As soon as he was old enough to go to school, he started at The Rockford Music Academy. He studies under Jacques Saint-Cyr. Christopher performs at select events with Emerald Wind. Each year, he performs with his sister, Christiana, at The Beloit Chamber of Commerce for the winter Holidazzle, The Beloit Historical Society Hanchett-Bartlett Homestead open houses, and for the Beloit Art Walk. Christopher's favorite pieces to play are traditional Celtic airs. ​Christiana has been performing with Emerald Wind at select events for a couple of years now. At 5 years old, she would sit at MaryKathleen's feet while she practiced harp. Her aptitude and love of harp grew so quickly, that she would pluck at the base strings while MaryKathleen practiced, and would make up duets to what MaryKathleen was playing. soon after, she began formal training at The Rockford Music Academy under Melissa Haeze. Christiana plays a variety of classical music, but also has written her own composition titled "Mice at Night". Emerald Wind has performed all over Rockford, Beloit and the stateline area for years. They have composed many original pieces heavily influenced by their Irish heritage. Repeated requests for their music have prompted them to record and now have three CDs with so many more originals they will be kept busy recording for a long time to come. Follow us on Facebook for more music delight! They have played for various venues ranging from bistros, concerts, festivals, theatrical performances, special celebrations, such as Christmas, Art Scene, Main Street Market, and private events such as funerals and weddings. ​Serving the southern Wisconsin and northern Illinois areas, Emerald Wind Music is ready to breathe life into your special event! Whether it be a wedding, private party, retail/commercial performance, or funeral/wake or birthday party, Emily and Mary Kathleen are sure to set the right mood for your special event.